The Woods-Rettig Funeral Home was started in 1890 by H. B. Crowell in the basement of the building on Main Street occupied for many years by the Woods Furniture Store. His son, C. L. Crowell took over the business in 1900 and in 1903 George J. Woods was welcomed into the business and became a partner In 1920. The business outgrew its location and moved to a new site on Front Street, also in 1920 and was moved to Summit Street in 1927. At the death of C. L. Crowell in 1933, George Woods assumed full ownership and continued its operation until his death in 1948. 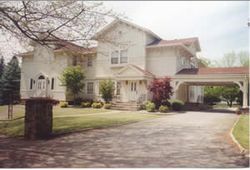 George's son, John G. Woods, joined his father in 1936 and in 1937 they carried out an extensive remodeling project. John Woods continued the business following his father's death and for a period of years was assisted by James R. Beilhart. Due to more people using the facilities of the funeral home, rather than their own home, a chapel was added to the west side of the building. In 1977, Wallace and Jon Rettig purchased the business and the property and operated the business until 1997, when Wallace retired. In 1986, the association, Family Care Services was formed, comprising Warrick-Kummer Funeral Home, Woods-Rettig Funeral Home and Van Dyke-Swaney Funeral Home. On January 1, 1998, the association became the corporate head of the three funeral homes. Eudora (Swaney) Carpenter is Corporate President, John F. Kummer and Jon W. Rettig are Vice-Presidents, Ellen C. Rettig is Treasurer and Wonda J. Kummer is Secretary.